I had one of my more epic yard sale wipe outs the other day. Running, running, running, and then down, sliding into home base, along gravel, sand, + dirt. It all happened in a flash. Keys, leash, iPod exploding from my hands and into the surrounding underbrush. People helping me up. Hands, knees, and favorite sweats...all shredded. Bleeding from every limb. Gravel, sand, + dirt in places it should never be. 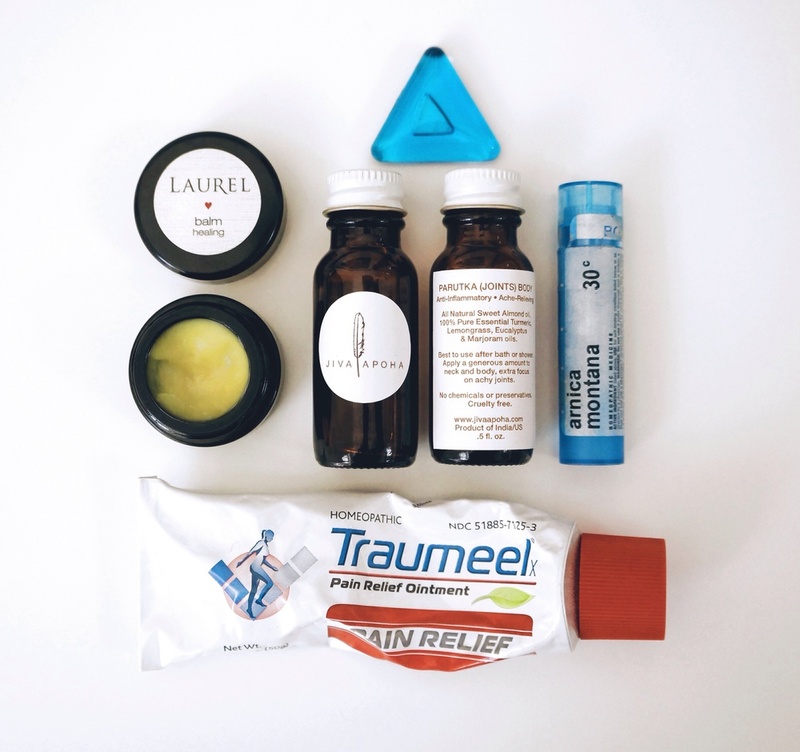 Luckily I have my favorite healing salves, creams, and tools on hand to set forth a rapid recovery. LAUREL ORGANICS HEALING BALM | I love this balm and have been using it everywhere, especially on my post pre-cancerous mole removal burns on my face, which have been healing beautifully. But it came in extra handy for the massive amount scraping that I collected in my spastic fall. It features a whole plant blend of Calendula, Comfrey, Lavender, Yarrow, Marshmallow, and Self Heal to soothe, heal, calm inflammation, and treat irritations. JIVA APOHA PARUTKA BODY OIL | this is my full body's favorite post-bath, pre-bed oil for my achy Lyme joints + muscles and helpful post fall for a general all over soreness. It is unbelievably healing on so many levels. "This particular blend of potent all-natural essential oils in a base of soothing, skin-strengthening Sweet Almond oil couples well with massage when applying it. Turmeric and Marjoram fight inflammation, are warming and increase circulation to aid your body’s ability to heal itself. Lemongrass and Eucalyptus are stimulating, refreshing and up-lifting." A must have for anyone battling chronic pain. Coming soon to the M•PARKE SHOP! ARNICA MONTANA | the homeopathic medicine that can help relieve muscle pain + stiffness due to minor injuries, overexertion and falls. Also helps to reduces pain, swelling and discoloration from bruises. TRAUMEEL | I had always kept this homeopathic creme on hand for my massage clients as it is super effective for sore muscles and bruising. It consists of 14 natural ingredients including Arnica, and is a wonderful compliment to taking the Arnica internally. TACHYONIZED ENERGY CELL | while I am not an expert in quantum physics, I do believe in all types of energy and the powerful healing that can come through when energy systems are open. The science behind Tachyon Energy is quite fascinating, but a bit challenging to articulate. I have been testing out these energy cells from Dr. Gabriel Cousens on my chronic sore spots for a while and feel like they have been very helpful. So after my fall, I taped this to one of my knees to fascilitate healing. "From the holistic healing point of view, complete healing is an integration of the physical, emotional, mental and spiritual levels. Living beings evolve in a continuous upward spiral of order to chaos (and/or disease). The energy spiral continues through the chaos to higher levels of order. Chaos is a stepping stone from one level of order to the next higher level. Every living being experiences this process of energy flow whether or not they are aware of it. Tachyon Energy is the key to moving through chaos and stress in our daily lives; creating new levels of order and quality of life. Tachyonized tools significantly contribute to achieving near-perfect energetic balance at all levels."